Disclosure: I received a copy of the DVD for review purposes only. Any opinions are my own. There is no better family movie for Halloween than Hotel Transylvania 3. The Drac Pack is back just in time to celebrate in this spooky, fun movie! This must-own comedy, continues with the cast when Mavis surprises Dracula with a family voyage on a luxury, haunted monster cruise ship. Of course, the rest of the Drac Pack has to go along, and that’s when things get a little...batty. Hotel Transylvania 3 is now available on Digital and will be available on 4K, Blu-ray, and DVD on October 9. The third film in this family-friendly monster franchise is the best reviewed installment and you’re invited along on the haunted cruise vacation! The all-star voice cast is back, along with some new faces as well including Adam Sandler, Andy Samberg, Selena Gomez, Kevin James, David Spade, Steve Buscemi, Keegan Michael Key, Molly Shannon, Fran Drescher, Kathryn Hahn, Jim Gaffigan, and Mel Brooks. My family and I have seen all three films and love them all. Pick up the latest DVD October 9th or enter below to win. 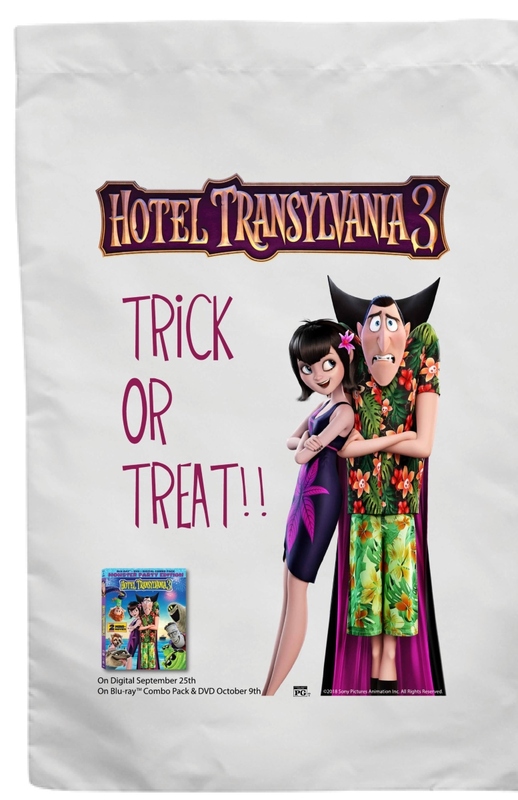 Hotel Transylvania 3 is filled with more than an hour of engaging bonus materials including three “All-New Scary-Oke Sing Alongs”, a monster dance party dance along to “I See Love” by Joe Jonas featuring Jonas Blue, plus a fun zing-tastic read along with Drac. Families will enjoy all the fun with the “Plan Your Own Spook-tacular Sleepover” feature, perfect to binge watch all 3 Hotel Transylvania movies. Also, "Vampire Make Over: Mavis and Drac Tutorial”, and go behind-the-scenes to explore the amazing talent who bring these characters to life in “Behind the Screams – The Voices of Hotel Transylvania 3". Click on the picture below to enjoy six great stencils of the Drac Pack for your pumpkins this year! (which would double as a great halloween sack to collect your loot). Enter using the rafflecopter form below. Ends October 9, 2018. Good luck.